It is almost SIXTY years since I gladly left the control tower at Sewart Air Force Base at Smyrna, Tennessee, vowing never to go back. I plainly remember the horror I felt when sentenced to an Air Force career as "Control Tower Operator". The NCO who did that sentencing did so on the basis of my civilian profile, which indicated I had worked briefly as a radio announcer here in Chattanooga during my early college years. "Do you like to use your voice?" he had asked, and I had unwittingly answered, "Yes", only barely envisioning what my answer would lead to. That affirmative answer at Lackland Air Force Base in 1956 got me shipped out to a 13-week Air Traffic Control school at Keesler AFB, located at Biloxi, Mississippi. That school was said to be one of the Air Force's longer lasting academic courses, requiring 13 weeks of much concentration both in class and out. My classmates and I settled into some really fine air-conditioned barracks which had sturdy metal desks ideal for spreading books out and burning some midnight oil. The "soldiering" of Basic Training was behind us by now and we only had an occasional parade which required us to wear a Class "A" uniform. Our classes were broken up into one- and two-week segments which led us through many topics and which took us to graduation. We took an exam at the end of each segment which later became an integral part of our FAA License. Upon graduation we were presented with a genuine FAA license (then called the "CAA"), same as a pilot's license, only minus actual flight training. The school work, as mentioned, was broken into many parts, and I forget most of them. I do remember that one segment was all about the layout of airports: the numbering system for runways, and all things found at major airports world-wide. We probably spent two weeks learning all about navigational aids which the average air passenger knows nothing about. We were astounded to learn, for example, how many such navigational devices existed to guarantee safety for both pilot and passenger: fan markers, omni ranges, different types of airways, Instrument Landing Systems (ILS), inner markers, outer markers, UHF and VHF frequencies, middle markers etc. A lot of those facilities came with both inbound and outbound headings which every would-be controller had to memorize! We were given a map of the entire gulf coast's control area at the start of our school and had ONE WEEKEND to memorize all those headings - inbound and outbound - of every navigational facility from New Orleans to Mobile, north to near Jackson, Mississippi! I remember some sleepless nights as I prepared for the Monday morning exam. I think we spent an entire week on "VFR" (Visual Flight Rules), and at least another week on "IFR" (Instrument Flight Rules). Other classroom work included Weather, and "Centers" - the invisible, hidden-from-view ARTCC (Air Route Traffic Control Centers) which handle all Instrument air traffic. (Control Towers are considered to be strictly VFR facilities). There are 21 of these invisible control centers across our country whose controllers sit before scopes to guide your flight safely through thick cloud banks, or around severe thunderstorms, and then "talk your flight down" from, say, 42,000 feet, to a much lower altitude where Approach Control takes over and lands your flight, with clearance from the VFR tower. These IFR controllers also handle flights both departing and entering the U.S. from foreign countries. Their work is mainly done by GPS in these modern times, of course, but what if the satellite goes out? Your friendly controller MUST still know - and keep well-abreast of - the old way it was done 100 years ago when aviation was new. Sewart Tower (my "work home" for nearly three years) had a close and amicable working relationship with Nashville Tower, and we all knew each other by the initials used at the end of every (frequent) phone convo involving the movement of aircraft. (Nashville handled the "Approach Control" to Sewart, as it was a congested area due to both civilian and military aircraft converging on the same area. One shift-chief in the Nashville Tower once flattered me by telling me they would like to have me work there after I left the Air Force! He knew that "recruiting" is forbidden in U.S. government work, but he just tossed out the idea that I MIGHT have a good job waiting at Berry Field in Nashville if I wanted it. (That was at least a happy thought, although he knew, as did I, that Civil Aviation requires attendance at its own school in Kansas City). Added to my feelings about Air Traffic Control, expressed above, I was in no way interested. The down side of life in a Control Tower is the constant confusion found there, as when you are trying to hear a weak transmission on one speaker when suddenly a loud voice blares out from another! "Ground Control" transmissions also interfere as well, and can blot out important information that the "B" position controller is trying to copy by phone. Transmissions frequently cut in and out so it would be impossible to decipher what the pilot meant. Standardized "phraseology" was an attempt to alleviate this problem, but did not always work when important data was at stake. During daylight hours the air traffic can be horrendous, with aircraft of all types and speeds trying to enter the traffic pattern - jets being handled in a totally different manner from prop-driven aircraft, and notwithstanding the fact we had already received a paper"strip" of information on every inbound flight. Also, there would always be some pilot waiting for takeoff who was absolutely sure the tower had a vendetta against him by withholding his clearance (which had to come from the Memphis center, which was frequently swamped with work), and such men sometimes would become belligerent as a result. 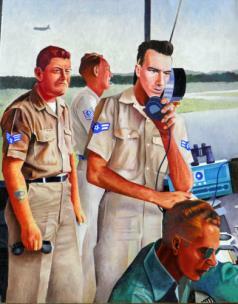 (The very idea of an Airman 2nd class (A/2c) giving orders to a Full "bird" Colonel pilot!) To be honest, I left day shifts in Sewart Tower with a migraine headache every day! Fortunately, however, there were other young men of only 18 or 19 years of age who really seemed to thrive on the daily fracas and constant verbal wrestling. Be glad that some of these latter airmen (frequently with only one or two stripes) were able to take the heat, and later DID go on to fine-paying jobs as fully operational and trustworthy civilian controllers. These well-paid good men and women should be lauded for their talent and skill as you flew safely home to Dallas or Miami at Christmas, allowing you to sleep or read a book as they vectored your plane around some truly serious weather and kept your flight well separated from all others. In fact, it was that "fine pay" which inspired this writing today: Recently on the evening news they were reporting about good paying jobs which required no college degree - and Air Traffic Control was at the very top of the list! Turns out that the MEDIAN salary for such a controller is presently $120,000! And if you do not know what "median" means, just look it up - but it's HALF WAY between the lowest salary and the highest! You can imagine that a controller in the dense northeastern U.S., or in Atlanta, or LAX might deserve more than a controller at Roanoke, Huntsville, or Chattanooga. Besides city airports, there are also long-established reporting points for aircraft out in the "boonies" - as the one at Crossville, Tennessee. Aircraft flying on IFR are legally required to "report" every 20 minutes, while over water (on international flights) it's every 10 minutes. So, as you can see, there is a lot more to Air Traffic Control (ATC) than that handsome Control Tower which graces nearly every flight-line in America - and the world. If you have read this far, please remember that my experiences in ATC date from the time when Elvis Presley was just starting out, Eisenhower was President, and Russian dictator Nikita Khrushchev was hammering his shoe on his desk at the UN! It was in that brief time when the U.S. was not in any "hot" war - and we were between the Korean and Vietnam wars. A few things may have changed in 60 years, I know, but probably less that you would imagine. The entire concept of ATC is SAFETY, and you cannot possibly compress 2,000 feet of separation vertically, or three miles horizontally between aircraft - the minimums in my day - as I think it still is. We were told that the ATC system had changed very little between ca. 1920, when it started (in England), and 1956 when I entered the field. My generation used small circular hand-held "disc computers" to calculate rates of closure, etc. Modern computers have taken over much of that work, and radar screens have eliminated any "guesswork" which may have once existed - but remember: if that computer suddenly dies, it's back to the old - and still reliable - system. I should also mention that ENGLISH was the language designated as ATC's international language back in the 1920's. Local flights in places like Siberia or Mongolia might use their native language, but if the flight is to or from an international airport, English MUST be used. Should anyone be interested in a career in the field, you can get information on-line, for sure, and remember that ATC comes under the U.S. Department of Commerce. Our government does not discriminate as to race or gender. Oh, yes: How CAN a lowly A/2c give "orders" to a Captain, Major, or full "bird" Colonel? Answer: the Airman Second Class is licensed by the same FAA as the higher-ranking officers. The Airman 2/c does not give "orders", but "advisories" - which have the weight as law. If the pilot rejects that advisory, he is in violation. Again, I will concede that some of this may have changed: my generation, for example, did not have GPS. All I am trying to show here is that there are some remarkably fine - and brilliant - people working in the field and who CAN take the heat! Many thanks to the gentleman at Chattanooga Tower who helped me remember some long-forgotten facts!